& the Memories' justifiably legendary "Worst Record Ever Made," the man seems to be making some sort of elaborate inside commentary on the ephemeral nature of pop music that's funny and truly bizarre at the same time. On pretty much every song, it's clear Fowley has a way with a tune and a smart lyric (no matter what the thinking is behind it), and this music comes from the era when nearly every studio in Los Angeles was cranking out great-sounding records on a regular basis, so most of this sounds far more professional than one might imagine. 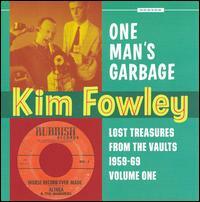 One Man's Garbage is a wildly entertaining ride through the roller coaster of Kim Fowley's mind, and his crazed liner notes only add to the fun. Can we look forward to Volume 2 ??? Great Stuff. Can we look forward to Vol 2. "Another Man's Gold" ? Thanks, Kim Fowley is great!